Pupils performed to a higher standard in the new tougher English and Maths GCSEs now graded from 9 (higher than A*) to 1. Cheers rang out across the borough yesterday [Thursday] as Hounslow students celebrated receiving excellent GCSE results. Pupils performed to a higher standard in the new tougher English and Maths GCSEs now graded from 9 (higher than A*) to 1. In English, 84 per cent of students achieved a Grade 4 (‘a standard pass’ - broadly equivalent to grade C) or better. The results are even impressive given that 70 per cent achieved the more challenging grade 5 (a ‘strong pass’) in this core subject. There was more good news in Mathematics, with 76 per cent of students gaining a GCSE Grade 4. This is a massive 16 per cent better than other pupils in England (60 per cent). More than half (55 per cent) achieved the ‘strong pass’ at Grade 5. Hounslow’s schools have also maintained a very strong position in the number of pupils gaining the English Baccalaureate [EBacc], with 31 per cent of Hounslow pupils succeeding at this measure. The EBacc shows the percentage of pupils who achieve grades 9-5 in English and Maths along with A*-C in science, a language and a humanities subject. An excellent result given that, unlike last year, this is only awarded to those who gain a ‘strong pass’ in both their English and Maths. It is six per cent better than the National EBacc average last year (25 per cent) when it was easier for students to achieve. 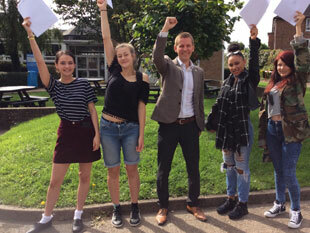 Councillor Tom Bruce, Cabinet Member for Education and Children’s Services and Youth Services, Hounslow Council, said: “Congratulations to all our students who have done fantastically well in their GCSEs again this year, particularly given the more challenging exams that the government has introduced. “It is a testament to the skill and commitment of all our teachers, support staff, governors and parents and the hard work of our young people that means they continue to outperform their peers nationally. “As a council we are proud of the continuing high quality education that is available in our schools. For those students who, having got their results, are now unsure about what to do next, the Hounslow 14-19 Connexions Team are available to provide free impartial advice and guidance on the range of options available. Students can drop in without an appointment at the times below. Drop in or call 020 8583 5151. • This afternoon [Friday 25 August, from 2pm-5pm] the service is hosting a special “What next after GCSE/A-levels” event. There will be an opportunity to access impartial advice and guidance, plus meet local colleagues and training providers. For more information, visit www.goo.gl/vyznKu or call 020 8583 5151.